Nice accessory to the Highpoint Farm Sink. Fits drain perfectly. Get just the look and finish you want. 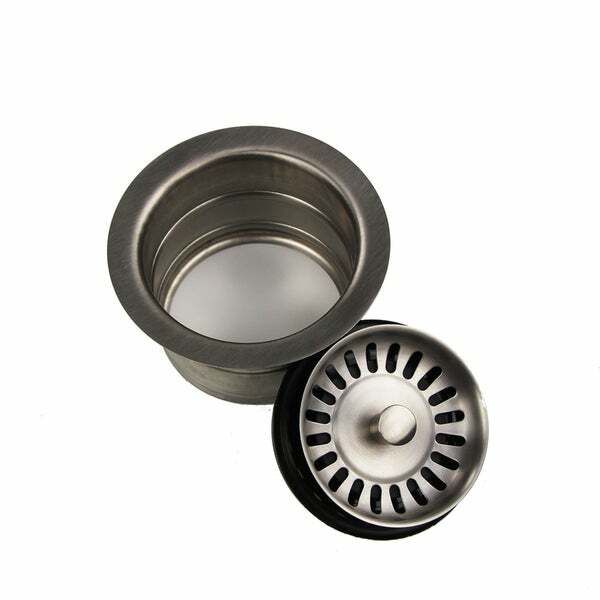 Brushed stainless finish disposal drain for use with sinks that have garbage disposals. This drain has and extra long flange that allows it to be used with sinks that have a garbage disposal. The brushed stainless steel flange will complement most stainless steel sinks. All the functionality and the reach that you need to complete the look of your sink. Used this with my farmhouse sink and my Moen 5923SRS stainless steel faucet. It fits perfectly and is very pretty. The farmhouse sink I used was the Highpoint Collection 30 In. Works and fits perfectly with the Highpoint sink we just received. This disposal drain goes well with my 30 inch farmhouse kitchen sink in my laundry room. I wanted a gray drain color to match my faucet. This does the trick. It came as recommendation from Overstock when I bought the White Italian Fireclay Farmhouse Kitchen Sink. I just installed this sink last week and I absolutely love it. Excellent quality, look, and perfect size. Drains well. While it came with a screen, I have not used it as I like the look of all white sink. I would absolutely recommend this sink! This goes with the sink if you don’t use a disposal, but if you are this isn’t needed. It is good quality. I got this because I read you had to have this elongated drain with a garbage disposal on this type of sink, research and ask your contractor before you buy. Does what it should for a disposal drain. Item arrived on time and installed easily into our farmhouse sink. Would recommend this to anyone looking for a new drain. Got this to fit our new Highpoint Fireclay Farmhouse sink. Have not installed it yet, but it looks great! Has a deeper neck to accommodate disposals. packaged well and looks fine, but I bought it thinking I needed it in order to install a disposal under my farmhouse sink. Could not use it with a disposal. Money wasted, but the product itself looks pretty and would have worked fine if I had not needed a disposal. Great! This disposal drain will go well with my new farmhouse sink! Love it! Exactly as described. Used to help with the disposal install. Good product with farmshouse sinks. Works well and durable. Fits nicely into the sink install. I bought this to go with my farm sink and it was the correct color.. It works well for what it is. No leaks. No rust. I would purchase again. The price was right . I've been able to get this and many plumbing parts at a great discount. This is high quality and easy to install. There is no reason to pay more! We paired this with our farm sink, it was needed when attaching it to the water disposal. It’s easy to clean, I’ve even put it in the dishwasher for deep cleanings. Works very well! Looks nice and comes with multiple covers. The only issue I have is that the rubber insert has a very small opening so I’m always having to push food scraps down through it and makes the water drain much slower. This drain works very well. It is fitted in my farmhouse sink, and it works perfectly. I would recommend this drain to all buyers. I am very glad that I purchased it. I’m using this in the new farmhouse sink. It holds water nicely. I think it works well! "Will this "Highpoint Collection Brushed Stainless Finished Disposal Drain" fit a BADGER 5 Insikerator?" Yes, the factory specifications state it should fit all Insinkerator models. 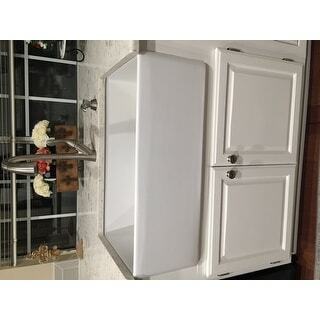 "I purchased this sink along with the correct drain for a garbage disposal. However, can you please suggest a garbage disposal to use? Or at least what to search for online? thanks!" Per the description this drain is compatible with Insinkerator ((ISE) old and new models) Kenmore, Maytag, Ace, Jenn-Air, Kitchen Aid, Whirlpool disposals. "Is this drain suitable if no garbage disposal is installed?" The drain is designed only to be used with a disposal unit. "is this for a 3 bolt assembly?" Yes, per the description. For disposer with 3.375-inch I.D. and 3 bolt mounting. We have a garbage disposal and the sink we purchased did not have a comparable drain.